There is not a big secret that Blackjack Hall of Fame was created with a purpose to honour the most prominent blackjack personalities and the most professional blackjack players. Thus, every cards pro is included in the list of its members as well as talented authors of helpful blackjack books and tutorials, famous blackjack scammers and inventors of cheating schemes and other personalities whose contribution to blackjack world was considered to be incredibly great. 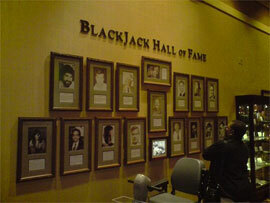 Hall of Fame was founded in 2002 and in the same year 7 awards were given to different blackjack pros whose substantial role in blackjack history cannot be forgotten. We decided that it is necessary to introduce those first inductees to you. He is without any doubt referred to the most respective blackjack players of all times. One of the greatest achievements of Al Francesco is considered to be his successful attempts of creating a blackjack playing team (plus a concept of 'Big Player'). Francesco also taught a talented card counted - Ken Uston. That was a man that knew incredible number of strategies, tactics and techniques and applied them successfully whether he was playing alone or in a team. Ken Uston is also a talented author of many books, including incredible 'Big Player' where he disclosed various blackjack secrets and explained the game. Wong is a popular author of 'Professional Blackjack' book. Apart of it he has amazing math skills and is definitely able to explain various strategies, methods of counting as well as invent these. Thorp is considered to be a father of brilliant card counting system and he is also the author of greatest blackjack book - 'Beat the Dealer'. The contributions of Peter Griffin as a math genius are highly appreciated by all contemporary blackjack players. He created different schemes for numerous card counting systems comparison. Arnold Snyder brought the card counting to the new level by mentioning the significance of win rate of card counter. He is also the author of 'The Blackjack Formula'. Tommy Hyland was a legendary founder of the most long-lasting and successful counting team in blackjack history. Together they won millions at casinos all over the world.